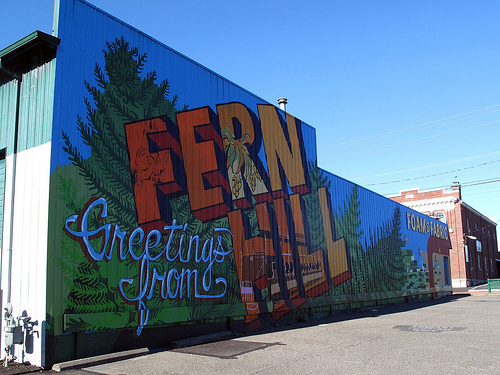 The Fern Hill neighborhood has a wonderful mural that boldly declares Greetings from Fern Hill! The mural is located on the corner of South 84th Street and South Park Avenue on the Foam and Fabric Building. The lead artist for the mural is Kelda Martensen. This webpage shows the mural as it is being developed. This entry was posted in Art -- there is art here!, Tacoma, WA State - Pierce County and tagged 84th Street, Fern Hill, Kelda Martensen, mural, Park Avenue, Tacoma, WA on July 5, 2011 by admin.